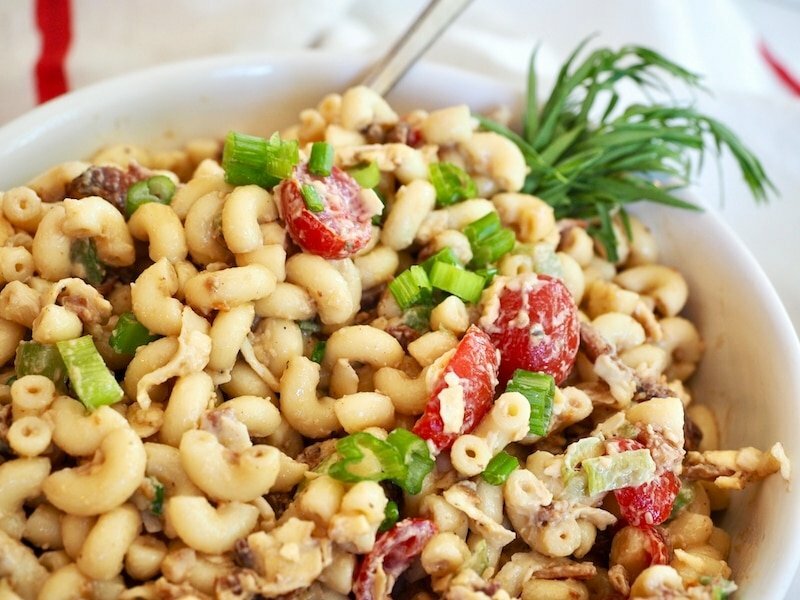 You read that right….BACON Balsamic Macaroni Salad!! 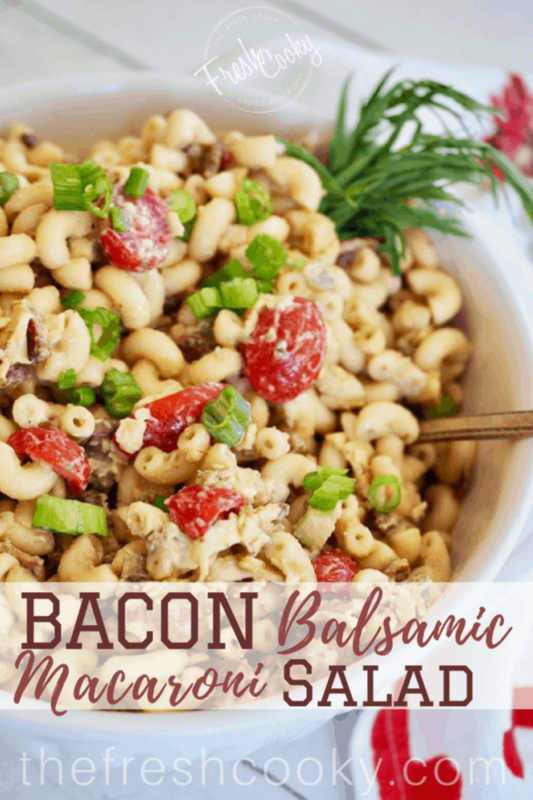 Crisp bacon pieces strewn throughout this delectable, creamy bacon balsamic macaroni salad that is loaded with crunchy celery, bright red grape tomatoes, sharp cheddar cheese and topped with a mouthwatering and tangy creamy balsamic ranch dressing. Bacon! People go nuts with bacon! Why is that? 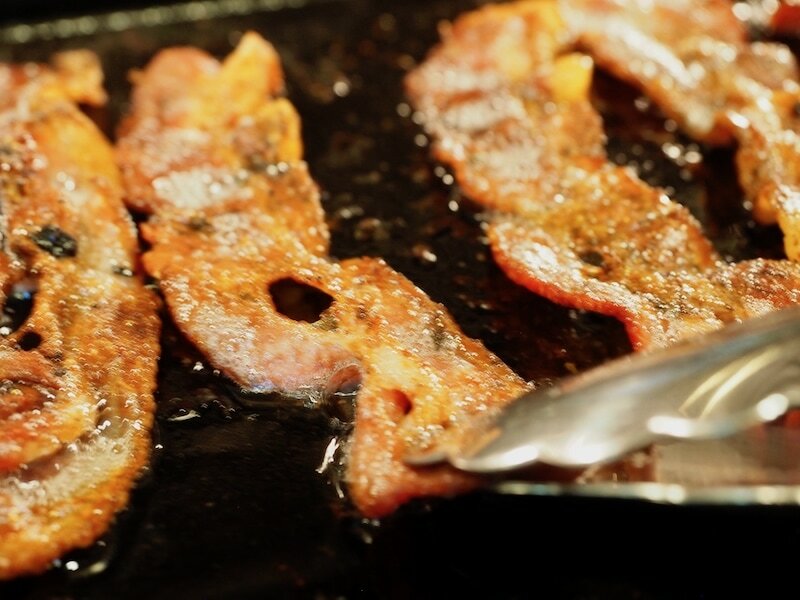 Perhaps it’s the crispy, salty nature of a slice of bacon, perhaps it’s the aroma wafting up to your bedroom tickling your nose and beckoning you to come downstairs on a sleepy Saturday morning, whatever it is, it works! I’m not a huge pork fan and yet I L.O.V.E crispy bacon! Can’t be limp or undercooked, no siree, has to be cooked crisp and crunchy! Heck, I know several vegetarians who say they have one meat exception; BACON!! That cracks me up! This recipe is from my dear friend, fellow blogger and cookbook author, Eliza! When she posted this recipe from her latest cookbook, Bacon, Beans and Beer I knew I had to try it. 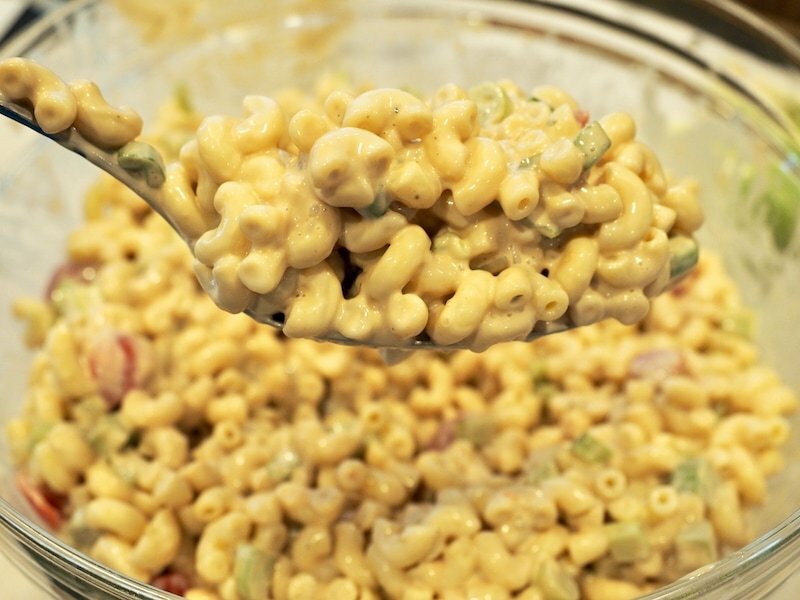 I’m not a big fan of your standard over mayo’d up macaroni salad — this is quite the opposite, lighter and fresher and in case I didn’t mention it — it has BACON! Gather your simple ingredients. 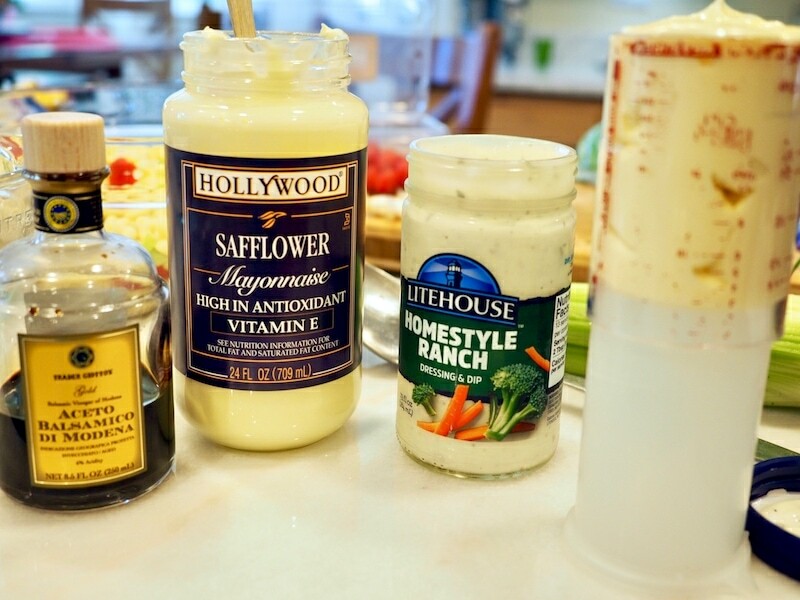 Hollywood Safflower Mayo just happens to be the mayo I grew up on, I’ve never been satisfied with other mayos, give it a try! I find it at our local grocery store in the natural section. Add several teaspoons of salt to your boiling water. Cook macaroni according to package directions; be sure to drain and rinse well with cold water. 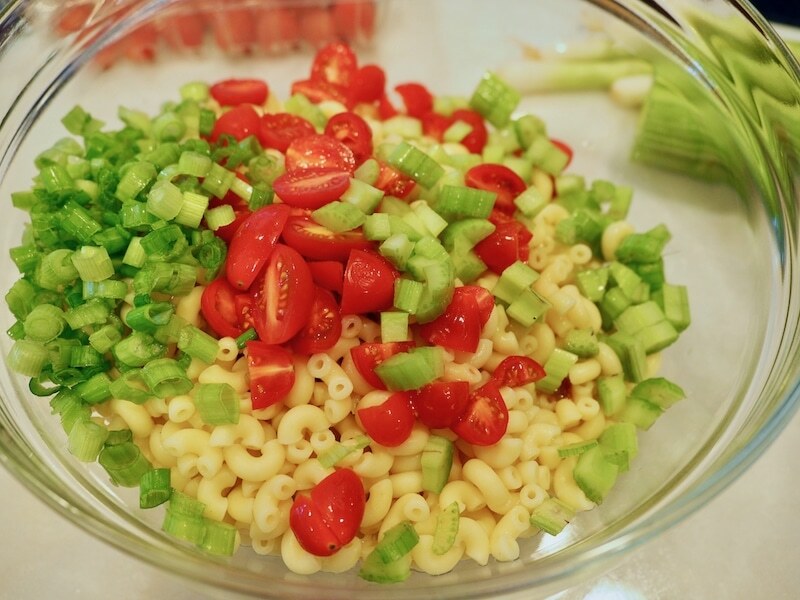 While your macaroni is cooking; chop your celery, green onions and halve your grape tomatoes (or a large tomato, chopped). Hold off on the bacon and and cheese, you’ll add those after it’s chilled out a few hours. Grab a small mixing bowl, combine your dressing ingredients and gently whisk until combined and smooth. At this point, cover and refrigerate a minimum of 2 hours or even overnight. Time is your friend with this dish. Just before serving add your cooked and crumbled bacon, shredded cheddar cheese and if desired chop a little fresh tarragon and mix to combine. Garnish with fresh chopped onions and a sprig of tarragon if desired. By the way, I think tarragon is a highly undervalued herb, highly aromatic, sporting a taste somewhat similar and yet so different than anise. Try it on your cooked carrots sometime…be still my pulsating palate! This dish tastes even better the second day! It’s delicious and pairs perfectly with my Hanneman’s Flank Steak or Summertime Kebab’s. This amazing recipe has been slightly adapted from Happy Simple Living. Love this recipe? Give these other fabulous salads a try! 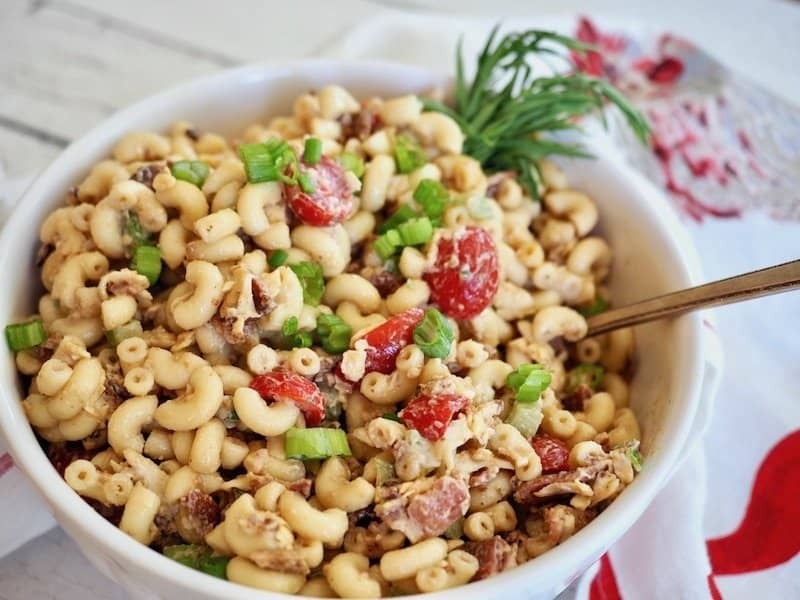 Crisp bacon pieces strewn throughout this delectable, creamy bacon balsamic macaroni salad that is loaded with crunchy celery, bright red grape tomatoes, sharp cheddar cheese and topped with a mouthwatering creamy balsamic ranch dressing. Cook your macaroni according to package instructions, be sure to add a couple teaspoons of salt to the boiling water. While pasta is boiling, chop your tomatoes, celery, and green onions. Once the pasta is done, drain in a colander and rinse well under COLD water. Place cooked and drained pasta in a large bowl, mix in chopped tomatoes, onions, and celery. 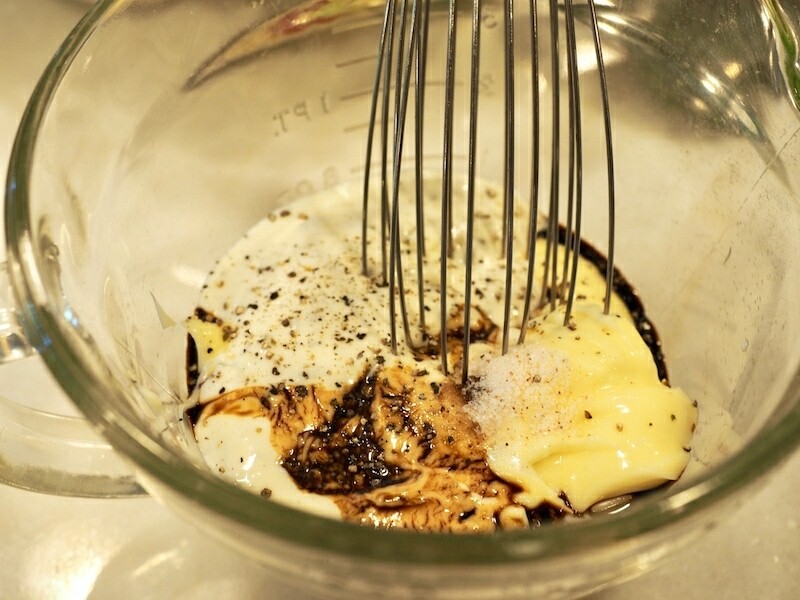 In a small mixing bowl combine your mayonnaise, ranch dressing, balsamic vinegar, salt and pepper. Whisk well until combined and smooth. 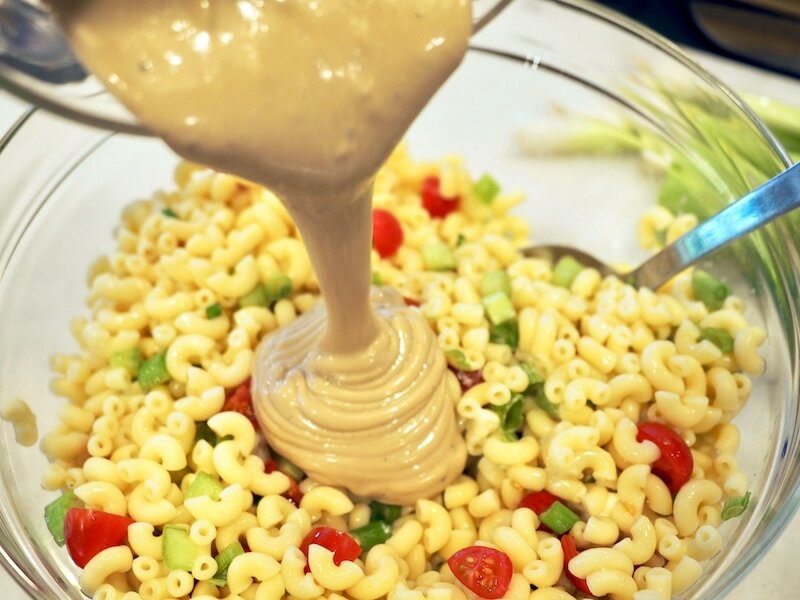 Pour dressing over macaroni and gently stir to coat. Refrigerate for a minimum of 2 hours, up to overnight (or longer if needed). When ready to serve, add your crumbled crispy bacon, shredded cheddar cheese and optional fresh or dried tarragon. Stir to combine, if desired, garnish with sprig of tarragon (or basil) and a few chopped green onions. Tastes delicious after a couple of days as well. Keep covered and refrigerated, lasts up to 5-7 days in the fridge. This recipe slightly adapted from the original at Happy Simple Living. 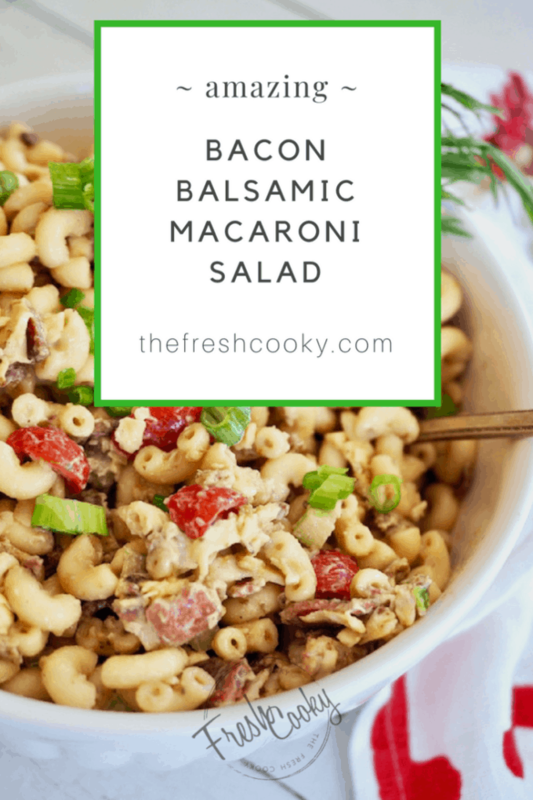 © 2018 | This recipe for Bacon Balsamic Macaroni Salad was featured first on The Fresh Cooky.